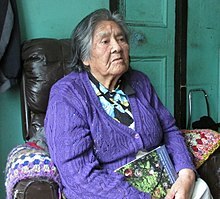 Cristina Calderón (born May 24, 1928 at Robalo, Puerto Williams on Navarino Island, Chile) is the last living full-blooded Yaghan person after the death of her sister Úrsula in 2005. By 2004, Calderón (often referred to as simply "Abuela", Spanish for "grandmother") and her sister-in-law Emelinda Acuña were the only two remaining native speakers of the Yaghan language. After Acuña died at 84 years of age (October 12, 2005), Calderón became the last living full-blooded Yaghan person. With her granddaughter Cristina Zarraga and her sister Úrsula Calderón she published a book of Yaghan stories called Hai Kur Mamashu Shis (I Want to Tell You a Story) in 2005. As of May 2017, she was still alive and residing in her hometown of Puerto Williams. Cristina Calderón has been officially declared Illustrious Daughter of the Magallanes Region and Chilean Antarctica. She also has been recognized by the National Council of Culture and the Arts (Chile) as a Living Human Treasure in the framework of the Convention for the Safeguard of Immaterial Heritage, adopted by UNESCO in 2003. Likewise, she was nominated to be one of the fifty heroines in the celebration of the Bicentennial of Chile. ^ Cristian Muñoz Vera. "Cristina Calderón representará a la Región de Magallanes en la elección de la mujer del Bicentenario" (in Spanish). Retrieved 24 May 2011. ^ Azúa, Mauricio. "Mujer yagana busca preservar lengua a través de diccionario" (in Spanish). La Estrella de Arica. Retrieved 19 March 2011. ^ Jack Hitt (February 29, 2004). "Say No More". The New York Times Magazine. New York: The New York Times. p. 52. ISSN 0028-7822. Retrieved October 4, 2011. ^ Jackie Hailey (October 14, 2005). "Extinction on the horizon for indigenous tribe in Chile: Second-To-Last Yagana Woman Dies Of A Heart Attack". The Santiago Times. Santiago. 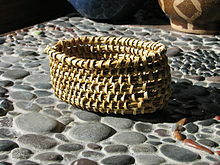 Retrieved October 4, 2011. ^ "La abuela Cristina la ultima habitante de la etnia del fin del mundo". Retrieved January 16, 2018. ^ Biobíochile.cl (May 26, 2011). "Última representante del pueblo Yagan cumple 83 años en Puerto Williams" (in Spanish). Retrieved 28 May 2011. This Chilean biographical article is a stub. You can help Wikipedia by expanding it.